Since 2009 3killabytes has been a well respected review show on YouTube. 3KB is made up of Jason Hooft, Mike Colangelo and Kat Jovey. 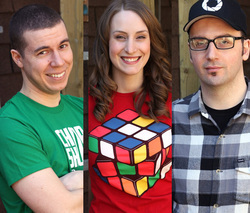 Each one of them brings their own charismatic and refreshing personalities together to make each video they release both entertaining and informative. Over the years they have reviewed nearly 200 video games and nearly 100 films, all with their own unique and lively flare. They've developed a strong relationship with both their fans as well as other well respected YouTubers within the game and film community.